This is the fifth in a five part series of tips and suggestions for replacing bearing in a precision CNC spindle. This series is specifically for the DIY person with limited resources. It is not a comprehensive description of how a fully equipped shop that specialized in spindle repair works. While we will reference certain specific spindle makes it is primarily intended to be rather generic. If you have a specific question please send an email at info@highspeedtechnologies.com or call 1-603-483-0333. In the previous four blogs we considered some tips on getting your spindle apart and we also considered some points concerning Angular Contact Bearings, lubrication and how to preload them. Last week we discussed Cylindrical Roller Bearings. This week we will briefly discuss, capture, hydraulic nuts and modified bearings. When we speak of capture we are normally speaking about how the bearings are held in the housing. Capture should not be confused with preload. Preload is usually set on the shaft and independent of capture. Capture is set in the housing and independent of preload. Capture is typically accomplished through the outer races and outer spacer between a hosing shoulder and a cover. Preload is typically accomplished through the inner races and inner spacer between a shaft shoulder and some form of shaft locknut. Generic example of setting capture for a Back to Back pair mounted in a housing. This illustration shows a generic example of capture. Here the bearings are a back to back pair preloaded on the shaft with match ground spacers. The shaft and bearing stack are loaded into the housing and fitted up to the housing shoulder. 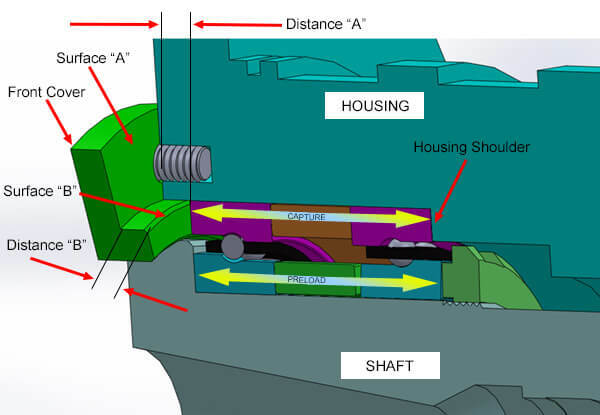 Once the bearings are loaded distance “A” is measured from the face of the housing to the installed bearing race. Distance “B” is measured. Distance “B” should be about 39-40µm (0.001”) longer than “A”. That’s your capture. If “B” is shorter grind surface “A”. If distance “B” is too long grind surface “B”. Once distance “B” is good the cover will capture the bearings in the housing. Both surface “A” and surface “B” as well as the housing shoulder must be square and flat otherwise spindle performance will suffer. The results can be poor part finish as well as premature bearing failure. Many spindles use hydraulic nuts and rotors. These offer certain advantages over threaded locknuts and other mechanical devices. For instance they do not induce stress from thread cutting or uneven compression forces as may happen with shrink collars. For that reason they do not have a negative effect on the running accuracy of the shaft. Removing them with the correct equipment is rather straight forward. They typically require between 8500 and 10,000 PSI to remove. Hydraulic Nut for a Mori Seiki NH4000. Note this nut also provides for balance adjustment. High pressure hydraulic fluid lifts the nut off of the shaft surface and at the same time applies an axial force that pushes the nut off the shaft. When the pressure reaches the release point the nut pops off. These units have a heavy interference fit and should not be removed by pressing them off. This illustration shows a greatly exaggerated clearance between the nut and the shaft. In actuality there may only be a slight spiral cut to allow high pressure oil to lift the nut off of the shaft and release it. Hydraulic nuts and rotors must be properly reinstalled to insure that all bearings are properly preloaded. This is somewhat more involved and we do not recommend setting a hydraulic nut for DIYers. Proper installation is a three stage process that involves, heating, cooling, pressurizing and setting and is outside the scope of this series. But as noted previously, do not just press these on. That will damage the surfaces. From time to time we (and our customers) are told that the spindle has “special” bearings that only the OEM can purchase. That statement is only half true. It may be true that the bearing manufacturer may only sell that particular special bearing to the OEM. However, that special bearing is almost always a modified standard bearing. In fact, to date we have not encountered a bearing that we cannot either purchase outright or modify a standard to match. Most special features involve lubrication. One of the most common modification that we encounter are holes through the outer race to allow oil lubrication to reach the rolling elements. Some specials include groves and other race modifications. This “Special” bearing has minute holes in the outer race. HST can do this. To make a special bearing HST first starts with a top name brand standard bearing. The bearing is carefully separated. Once apart the races are modified to exactly match the existing bearing. Then the bearing is cleaned, reassembled, cleaned again and lubricated. This is the last of our five part series on bearing replacement for precision spindles. We hope it provided some helpful insights. If you have a question about something in these articles give us a call or send an email. We’ll respond. And if you start repairing a spindle yourself and find you’re in over your head definitely give us a call. We may be able to offer some pointers. Of course, you can always send us the spindle to repair, even if it is in pieces. That is not uncommon. 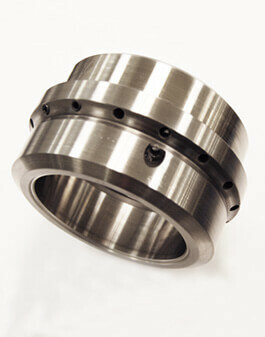 There is a lot more to spindle repair than just replacing bearings. 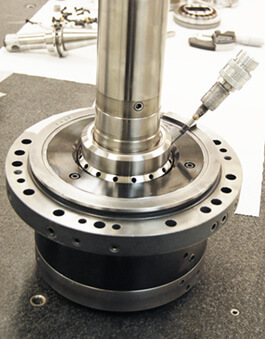 Balancing, pull force, motor drive, gripper assemblies, sensors, tool interface, springs, and vibration analysis are a few of the additional aspects of spindle repair. High Speed Technologies, Inc. has over 30 years’ experience repairing spindles. We are experts. So if you got a spindle problem give us a call. 1-603-483-0333.